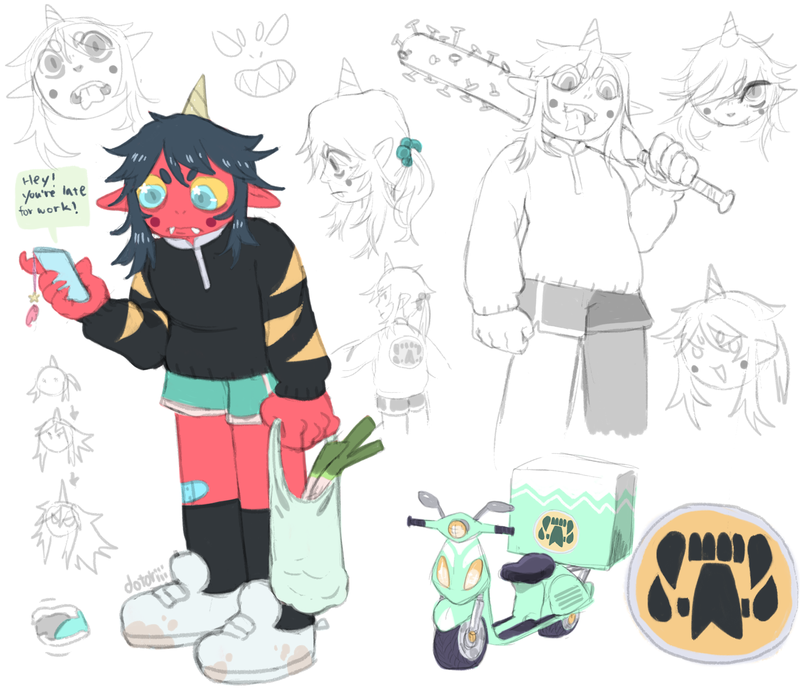 Ji-ho is a young dokkaebi who helps run her family's new restaurant/food delivery service, "Monster Meals," in Void City (they just moved in from a realm unknown by most humans). She works with her father (looks 75 but is very, very old), mother (looks 77 but is very, very old), older sister (appears 25) and older brother (appears 25) to provide a wide (magically infinite) variety of food. She's the youngest of her family and also the scrappiest. She'd rather be playing tricks on people or napping rather than delivering all kinds of food all over Void City. She finds it super bothersome having to go out and scoot around every day on her moped (she wishes she could be cooking with her family sometimes too). Super strength and speed and claws are what she relies on to keep the upper hand in a fight. In most situations she’ll grab anything around her to use as a weapon (sometimes she carries around a bat but usually uses her brute strength to punch, kick, headbutt, etc...). Unlike the rest of her family, however, she has minimal control over her fire powers. For reasons unknown she's never been able to control flames like the rest of her family does (they use these powers to cook food). This means she’s automatically put onto delivery duty. If you get her real mad she can be either your worst nightmare or the easiest opponent. She ends up overdoing whatever she's doing when she's angry and makes mistakes. It's also really easy to make her lose her temper. Under extreme circumstances, her latent powers surface and she transforms into a being of immense strength and magical prowess. Of course this is a dangerous situation for Ji-ho, as this condition takes a huge toll on her body afterwards. In her free time, she reads comics and plays video games. She also eats snacks all the time. During deliveries she sometimes sneaks some food from whatever she's supposed to be delivering. She's usually seen on her phone, napping in weird places or trying to pick fights with complete strangers. Her biggest goal in life is to move beyond scrappy delivery girl and become someone important and well-known. She seeks power and guidance in life to become someone her family can be proud of (the way to obtaining that power however can go down very different paths...). She also secretly desires someone to love (gender doesn’t matter) but is too stubborn to let anyone know. Don’t touch her horn (or her phone). Fun facts: She absolutely hates when customers don't tip. Also sometimes she wears a beanie cuz she's self-conscious about her horn.